WSU still an outside shot at the playoff. I'd say WSU has more than an outside shot at the playoff. If they can win out, a 12-1 WSU would be right in the mix with a bunch of other 1-loss teams. Of course, Bama and Clemson are all but locked in and Notre Dame might coast in as well. But in the mix of current 1-loss teams in the hunt many of them are still going to lose a second or even third game with the conference championship games still to come. I wouldn't say WSU has an inside track but if they win out they'd have to have something near 50% chance to get in. Then again they're not winning out. It would be great to get some chaos in the playoff this season. We need Bama to win out, then all other SEC teams have at least 2 losses. We need ND to lose at least one. Then the committee is in a tough situation of comparing 11-1 ND to 11-2 schools with tougher schedules. It would be great to see Clemson lose, but I'm not holding my breath. Root against OU, WVU, WSU, OSU, Michigan. At that point, there could be many 2 loss teams in the discussion, and it would basically come down to splitting hairs, brand, coin tosses, etc. It would be guaranteed to be unjust, which is great for chaos. A Utah team that's 11-2, having avenged an earlier loss by defeating that team in a championship game, will have a massive edge over any other two loss team out there contending for the No. 3-4 spot. In effect, we will be viewed as a 1-loss team. As long as branding can stay out of the equation, if the committee has no choice but to have a 2-loss team in its top 4, that team will be Utah. BYU @ Utah. Winner plays UW/WSU for Pac-12 title. USU @ BSU. Winner plays Fresno for MWC title. I'm sideways with you on this one. I loved Larry Culpepper - totally miss what I thought was a brilliant campaign. I loved the Steve Smith one last year. At least we agree on our love of the Utes. I pretty much never don’t cheer for the Huskies when they’re not playing the Utes. But we should all want the Wasu to win this. Much better matchup for us, and we want to play a higher ranked team. But I’m getting that sinking feeling that WA just looks better. I'm not sure about the match up. UW has a much better defense, and I think they can stop our offense. They also have the better coach. On the other hand, WSU carved us up for three quarters. I feel like they would have little difficulty scoring against us. We lost by a whisker in Pullman. We were never really in the game vs. UW, in our place. Did you watch that game? It was a pretty close one. Every bounce and call went against us. We dropped a TD return that would have made it 21-14. We had two key (incorrect) targeting calls lead to UW scores. We were close vs WSU on the road, that is true. Both games left you wanting another shot. We lost by two touchdowns to Washington, at home. Anyway, UW is better. Look what’s happening in Pullman right now. WSU has won some squeakers, like vs. us and Stanford. To be sure, UW has had some puzzling let downs. Awsome that we get to play one of these teams in the PAC 12 Super Bowl. Sigh! I'd like Utahs chances better against WSU. Our offense might be in for a long night against this defense. I do think UW has the best defense in the conference. We are #2. They hit us so hard in September that people started thinking Huntley was going to get Covey injured. And this time we won't have Huntley or Moss. On the other hand, Browning has been somewhat disappointing. We've seen him make bad decisions under pressure all season long. Stop Gaskin, pressure Browning, and beat Petersen. It goes both ways. We’re a worse matchup for UW than WSU is for the same reason UW is a worse match up for us. Rock breaks scissors. lost the ball out of bounds and we then couldn’t score from the 11. We’re not the same team now that we were then. If we just execute we can win. It will be interesting to see what the Vegas line is. I was making the point that UW is a tougher opponent for us than WSU. I do think we can win. I watched every minute of our win in Husky Stadium three years ago, and of last year’s game where half the stadium emptied with the Utes up by 7 with the ball and four downs with 3 minutes left, only to give up the ball and 10 points in those 3 minutes. That was an inferior Utah team playing probably a better Washington team than this year’s squads. We almost beat them two years ago when they went to the Final Four.  We’re in agreement. Sweet harmony! Probably helps us Bowl wise to have washington win. Wazzu probably still gets an ny6, opening a slot for Alamo or holiday for us. Uh...we will be in the rose bowl this year. 3) Targeting. Include the language "intentional" in any penalty that comes with an automatic ejection. The most important fix is something that fixes the arbitrary nature of this penalty. #1 and 2 make too much sense. Don’t expect the SEC to cede their power and money so easily. I’m not sure how asking a referee to judge intent, either real time or replay, will make targeting calls any less arbitrary. It would add complexity and provide even more debate to every call. Other than the Western Carolina the second to last game, what is wrong with it? That is sad. I knew he was sick. He was an absolute legend. I can't even imagine the level of dedication it takes to attend every game for 20+ years. Three Clemson players will miss the playoffs after failing a drug test. I wonder how prevalent steroid use is in college football. Has it been reported that it was steroids? I haven't seen that (yet). It seems that something like marijuana would be a lot more likely (and in a few years that probably won't be something that triggers a suspension anymore). So who do you have tonight? I think Bama wins easily. We'll see. Here's one thing we don't need: we don't need the SEC to become the destination for top Polynesian players. I like Tua a lot, but I don't want Alabama establishing a Hawaii pipeline. They already get whoever they want on the mainland! I think Bama wins by at least 14. As good as Trevor Lawrence is or will be, he is going to be very overwhelmed tonight. 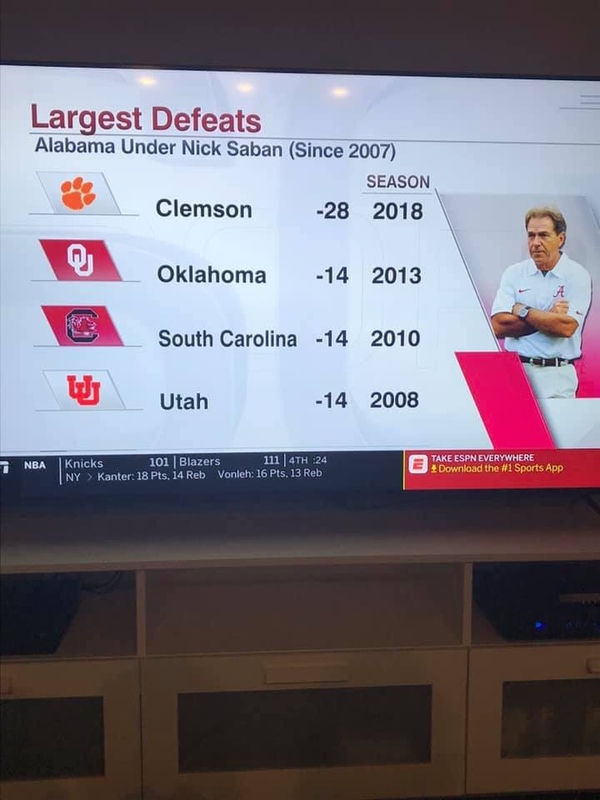 He hasn't seen a D that compares to Bama. Combine that with it being the National Championship game, the moment is going to be too big for him. I don't see good things tonight. Hope I am wrong. I was way off. Don’t listen to me. In other NCAA stupidity news, the NCAA is considering modifying the targeting rule to include harsher penalties. In addition to current suspensions, they have have discussed adding an extra game suspension for any 2nd targeting penalty. Targeting is the worst rule in college football because the penalty so often outweighs the crime. So naturally, they are thinking of adding a harsher penalty. Referees have shown zero ability to use common sense with this rule, and they have shown zero consistency in its application. The rule has reduced football to a state where any level of violence is acceptable as long as two helmets do not touch in the process​. Wouldn’t the Occam’s Razor explanation be television’s impact? Maybe...but I think TV ratings are also in decline, right?